This week’s look is an ode to both Doctor Who and Van Gogh, one of the best combinations ever! 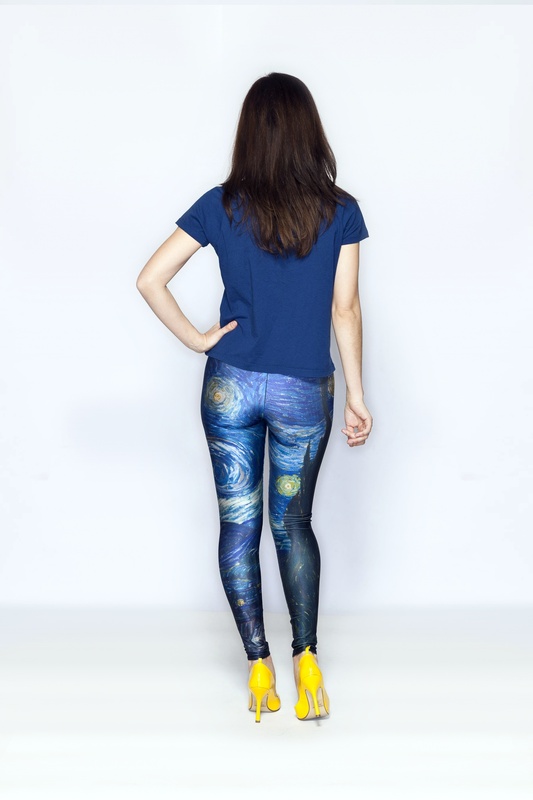 Featuring Black Milk’s Starry Night leggings and Her Universe’s Exploding Tardis shirt with a complimenting pair of vibrant yellow heels, there are various ways you can dress this outfit up or down depending on when the Tardis might drop you next. You can keep this look casual with just the top, but layering a look always helps bring it to the next level of being stylish. Throwing on a neutral black jacket gives a more finished look, while continuing the bold choices and going with a white vest and waist belt keeps this look on the fun edge of trendy. 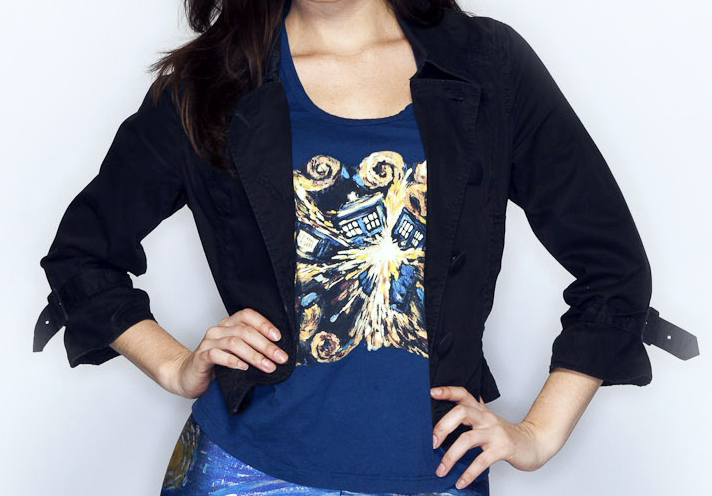 While it’s a bold choice to pair two busy prints together, it was obvious that when Her Universe came out with their exploding Tardis shirt, the two had to be paired together. The jacket or vest help ease back the busy colors and give the overall look a more subtle geek vibe – well, as subtle as prints like that can get. 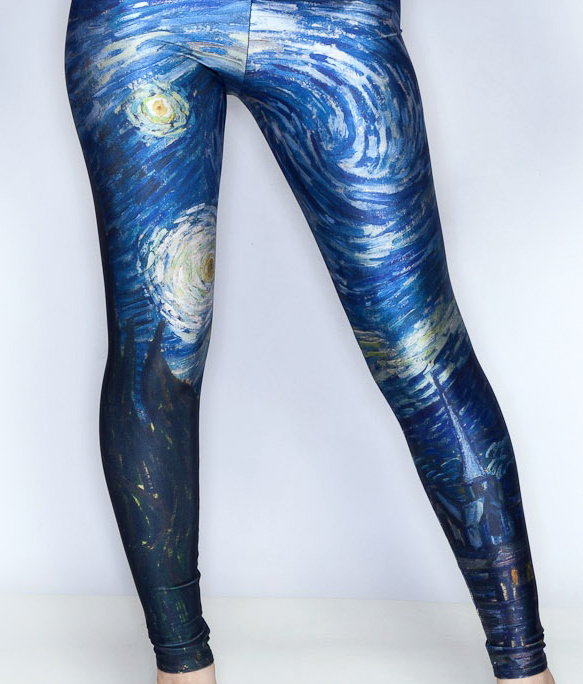 Black Milk’s Starry Night leggings are one of my favorite pieces – who knew one day I’d be able to incorporate them into a chic geek ensemble one day thanks to that Van Gogh episode! Thanks to that episode, it’s easy to take leggings like these and use them as a basis for many Doctor Who themed outfits. I already had these shoes in my closet, from an old cosplay no less! If I don’t wear black shoes with my outfits, I always love to wear a pair of shoes that shares a color that is in the outfit. The bold bright yellow of these heels pairs brings together the yellow in the shirt and leggings. The fantastic line of Doctor Who jewelry that was released by Harlequin Goldsmiths came out after I put this look together and did these photos. A pair of earrings or a necklace of the Eleventh Doctor’s Sonic Screwdriver is maybe the only piece this look is missing! Like this look? Want to show off or suggest some of your own? Tell us about it on Facebook and Twitter!